For more information on the LMTF and partners’ stories, access the complete report, Champions for Learning: The Legacy of the Learning Metrics Task Force. The Learning Metrics Task Force, or LMTF, was a group of education experts, civil society members, and government representatives convened in 2012 to catalyze a shift in the global education conversation from access on its own to access plus learning. 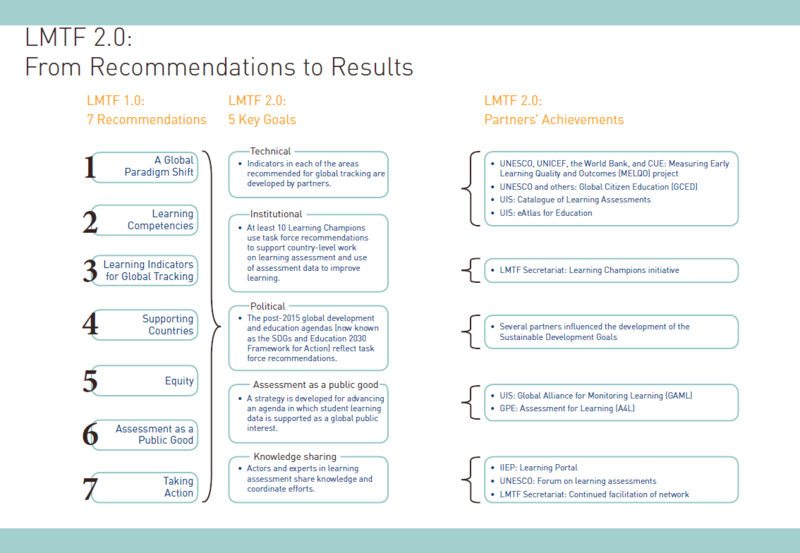 LMTF also sought to build consensus on global learning indicators and actions to improve the learning in all countries. After two phases of work, the task force sunset in early 2016. Although assessment of learning can be a complicated and technical topic, the LMTF rested upon a foundation of not only academic expertise but also of relationships. The participatory nature of the task force, exemplified by its rounds of open consultations and frequent in-person meetings, fostered an open and sharing environment among a diverse group of stakeholders. The lessons learned by those participating in LMTF are also valuable for other sectors, particularly as technology reduces the distance between cultures and global frameworks such as the SDGs emphasize the interconnected nature of development. The LMTF was an extensive partnership with a diverse array of stakeholders. To emphasize the participation and work of the coalition partners that drove the work over the past four years, we compiled a final report that includes many voices sharing how they contributed to and benefited from these efforts. The definition of learning was and has always remained controversial to us. I was tasked to head the research wing of KEPSHA in 2010, and I kept pondering how best to tackle the challenges of learning as we kept staring at the wastage of children graduating from primary school to secondary school. At KEPSHA, we were concerned that over half of the about 1,000,000 children who graduated from the primary schools in Kenya never proceeded to secondary schools. It seemed wrong that so many students would not move forward. Either they were not learning or we were not defining teaching correctly. At UNESCO, we know why we want to ensure inclusive and quality education for all and promote lifelong learning: Every human deserves the right to quality education, which in turn promotes societal and economic development necessary to respond to the rapid changes already evident in the 21st century. We know education must be improved around the world, from the least developed countries to the most advanced. We know we need all actors, from parents and teachers to world leaders, to be involved to meet these goals. We know we must achieve this goal by 2030. We must now answer the vital question of implementation: how will we achieve this goal? LMTF 2.0 worked toward achieving the recommendations from the first phase. After our meeting in the summer of 2013, it was clear to me that a link was missing in our ap­proach to strengthening national learning assessment systems. We needed a better structure to support financing, as many countries cited the lack of predictable and sufficient funding as a main inhibitor of assessment system reform. Because of GPE’s general work and our technical background, we offered to lead the development of a concept note on an international platform to support the development and strengthening of national learning assessment systems, which came to be called Assessment for Learning, or A4L. I remember attending the first meeting in New York, in September 2012, when the LMTF started forming the recommendations on the seven domains of learning. The foundational reports and presentations clearly explained what children should learn, and began the groundwork for how we can measure learning and use data. I brought a very clear vision from that meeting back to the city of Buenos Aires, where I was the director general of education planning in the Ministry of Education; a vision of the need to plan for a deep and comprehensive transformation in the curricula, in teaching and school organization, and in how assessment data was effectively used to improve learning. Buenos Aires needed to be ready to educate its students in all of the LMTF domains. Reflecting on all this, the greatest risk inherent in reforms is throwing out the baby with the bath water—we do not want to lose the education quality we do have through too many poor reforms. Africa’s education systems are facing many challenges. Each country must decide what is impor­tant, but the entire region can come together and share its efforts. The LMTF has sunset, but Af­rica as a region can take over its job of connecting passionate leaders around the issues of learning. Thus the Association for the Development of Education in Africa is creating the Network for African Learning Assessment (NALA) to bring Africa together around evaluation and monitoring of student learning. While the LMTF has sunset, the real work of implementation to move education systems toward both the SDGs and each country’s priorities is just beginning. Through global networks such as Global Alliance to Monitor Learning and Assessment for Learning and regional collaborations such as NALA, we hope the process of consultation and partnership continues so that all children receive a quality education by 2030.